Bull or ox heads were found associated to many megalithic buildings. Several bull or ox skulls were found in Wiltshire : In the Sherrington earthen long barrow an ox skull together with a deer antler was deposited in a cist of chalk blocks underneath the barrow. In the front of Manton tomb a pit was dug and an ox skull deposited aligned along the axis of the tomb. At the Beckhampton long barrow three ox skulls were found set along the axis of the mound. Several findings are known from Germany : Bull skulls were found buried for example in Heilbronn-Klingenberg and Weissenfels. 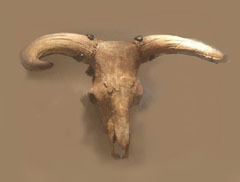 Several bulls head were found in the Neolithic settlement of Çatalhöyük in Turkey. The horns of bulls resemble the lunar crescent. Lewis-Williams and Pearce  remark that in shamanistic belief many animals are having supernatural powers. During rituals shamans often report to transit into an animal. Bulls were quite likely to been seen as powerful animals. The domestication of the Aurochs might have played an important religious role as human beings got control over wild animals. Bulls head might have stand for spiritual journeys in a tiered cosmos. A. Burl, Prehistoric Avebury, Yale University Press, 2002. E. Probst, Deutschland in der steinzeit. jäger, fischer und bauern zwischen nordseeküste und alpenraum, Orbis, 1991. D. Lewis-Williams and D. Pearce, Inside the Neolithic mind: consciousness, cosmos and the realm of the gods, Thames & Hudson, 2005.